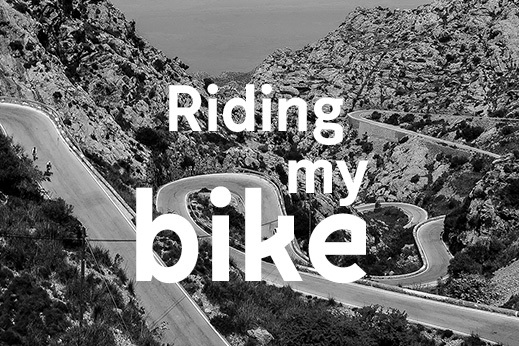 Almost every amateur sports cyclist dreams of winding his way up the legendary mountains of the Tour de France at least once. We also wanted to experience what it feels like to climb the heights where legends are made! 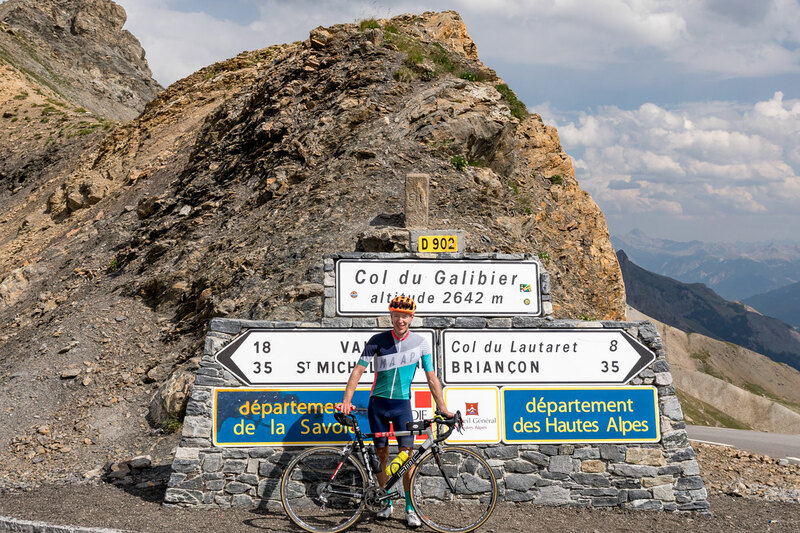 Alpe d’Huez, the Col du Galibier, Col de la Croix de Fer and Mont Ventoux were at the very top of our to-do list. 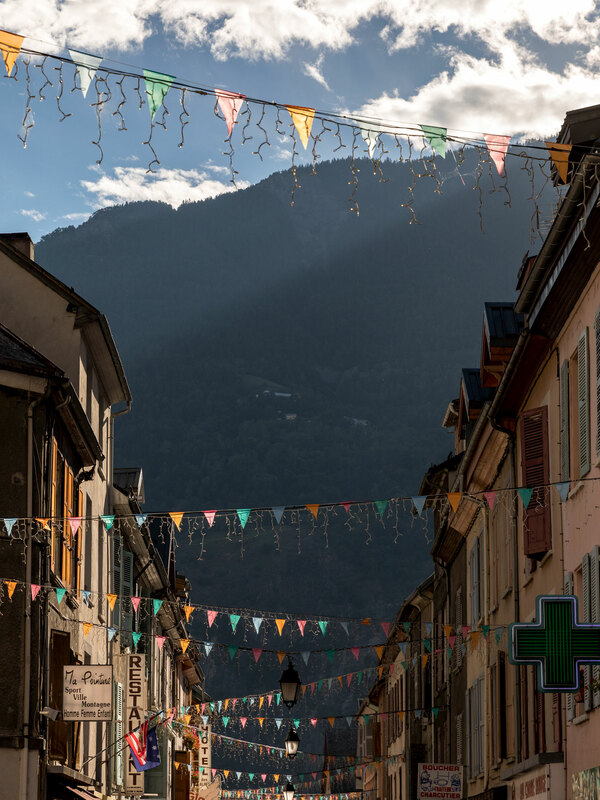 The starting point for our adventure was the small city of Bourg d’Oisans. 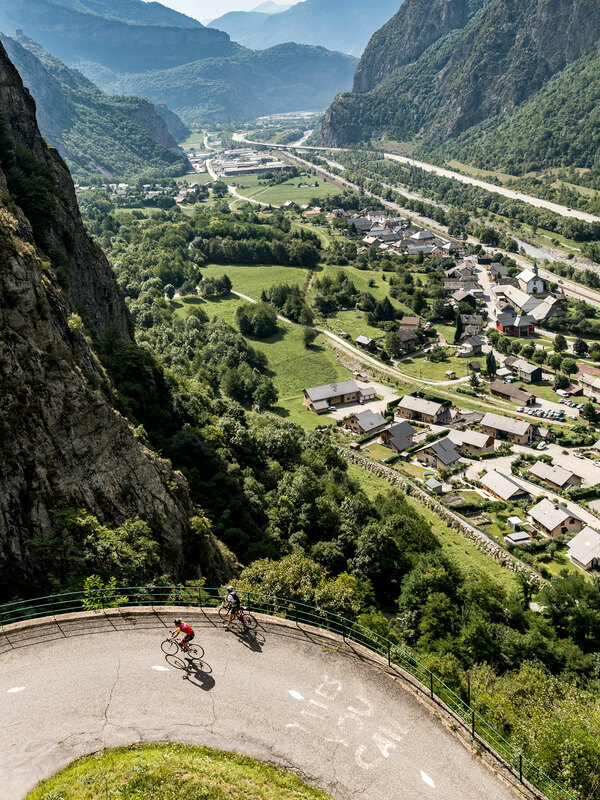 Situated in a scenic Alpine valley in the heart of the Dauphiné region, every year in July this peaceful town transforms into the cycling center of France. 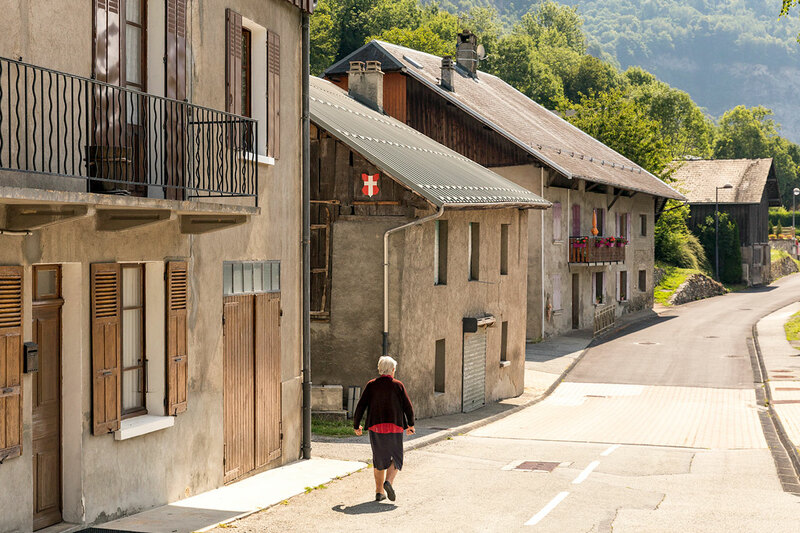 Bourg is the ideal starting point for tours of the surrounding mountain landscape. From here, it’s easy to boost the balance in your personal cumulative-elevation-gain account. 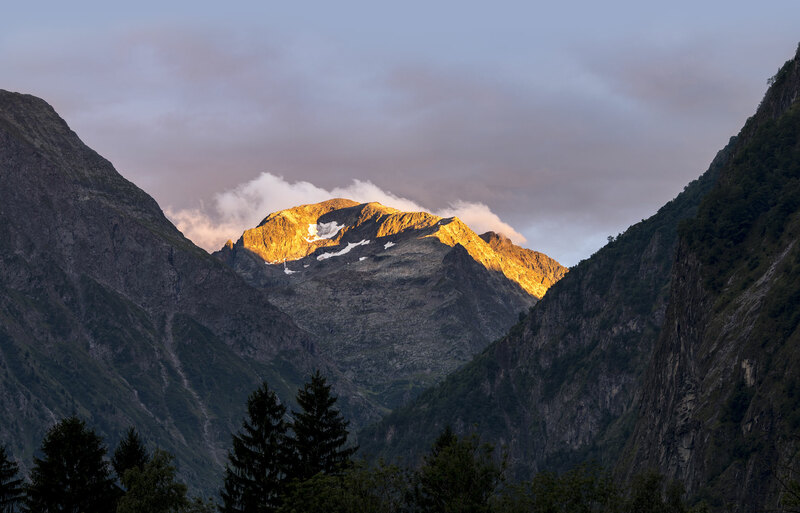 Morning atmosphere in Bourg d’Oisans. 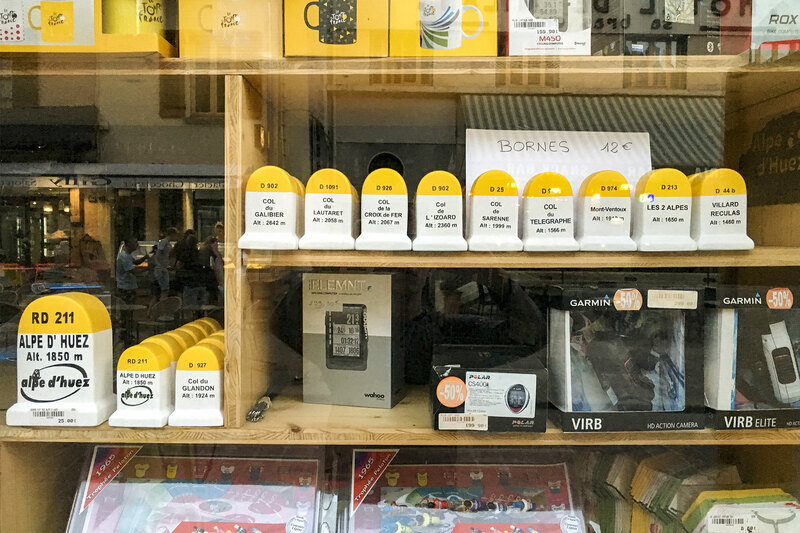 The stores in this small city are geared toward the needs of cyclists. 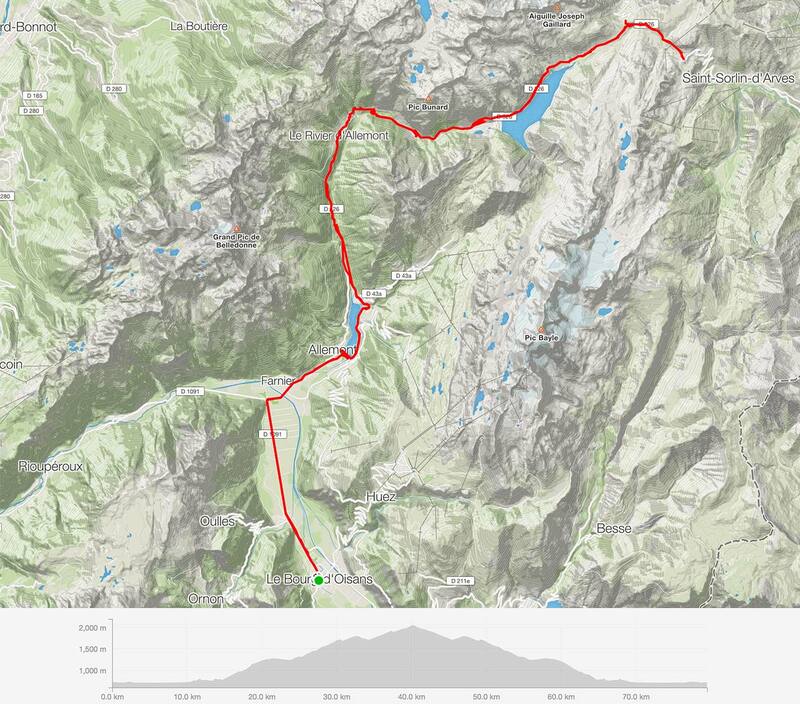 Tour 1 – Col du Glandon, Col de la Croix de Fer. 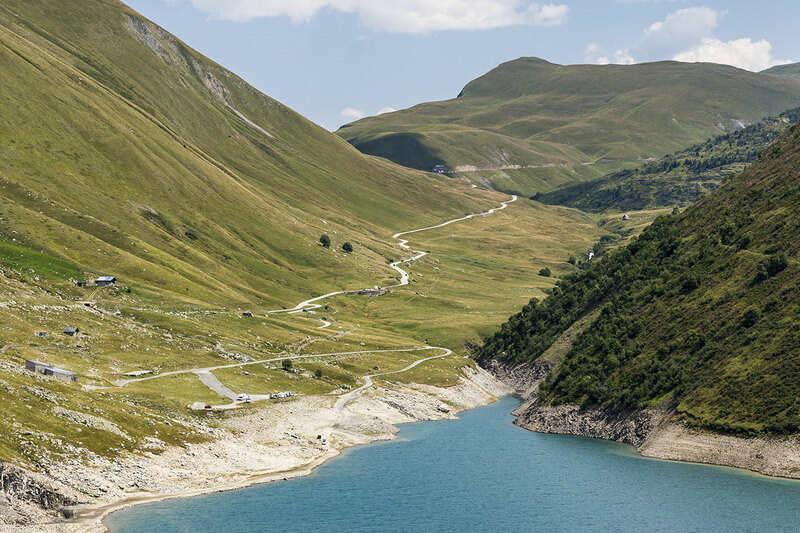 The Croix de Fer barely breaks the 2,000-meter mark. But irregular ups and downs mean that you have to climb quite a few meters in altitude twice. 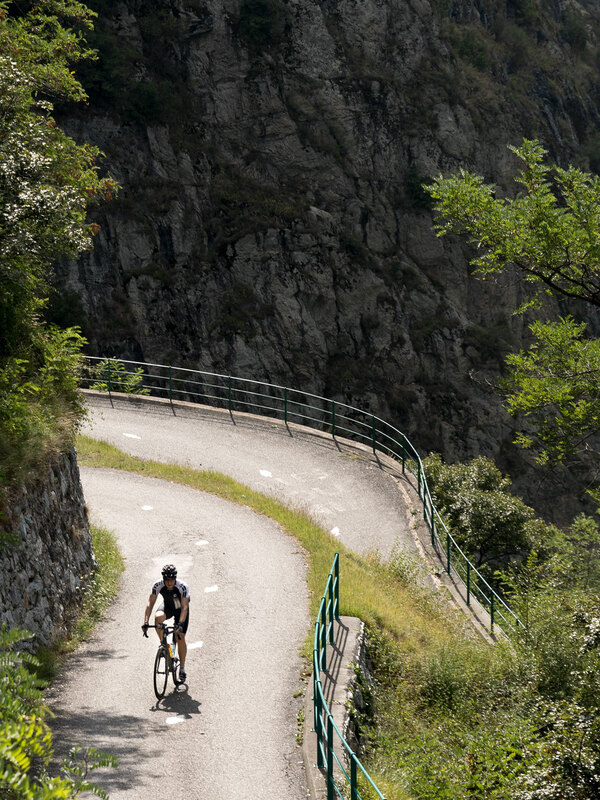 That’s why the ‘Pass of the Iron Cross’ is considered one of the most difficult climbs in the Tour de France. 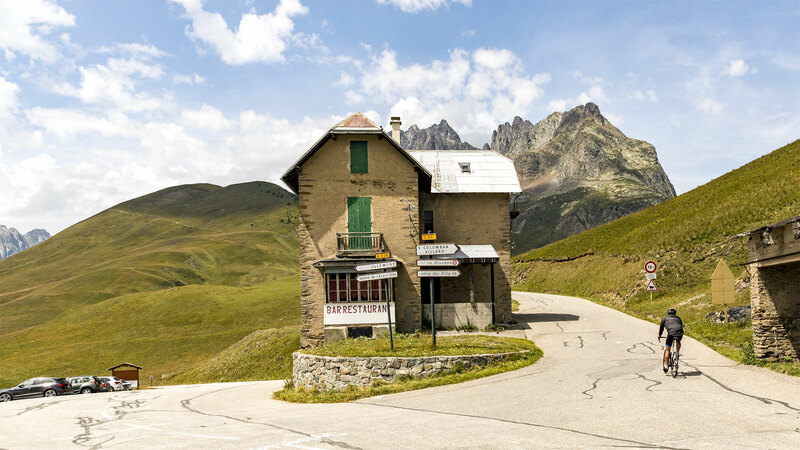 Nice addition: About 2 km before reaching the top of the Croix de Fer pass, you come to a small junction to the Col du Glandon. This gives you the chance to “check off” yet another major name – practically just in cycling by. 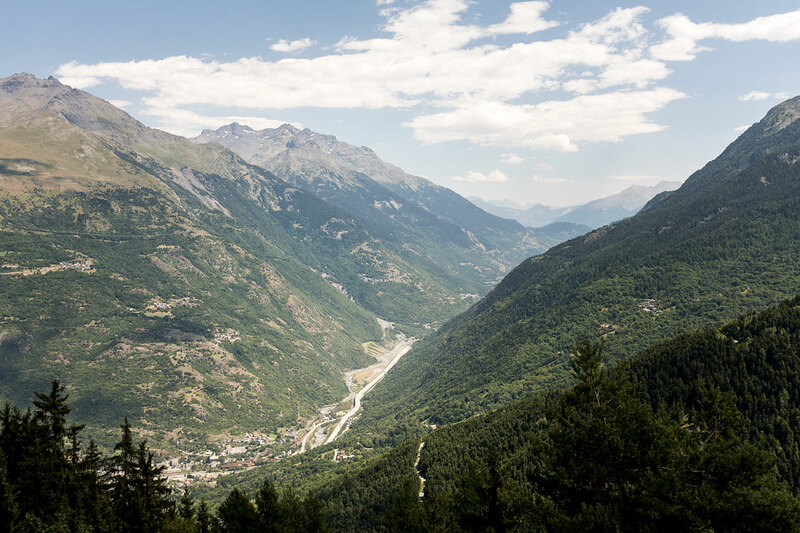 View from the Col du Glandon. 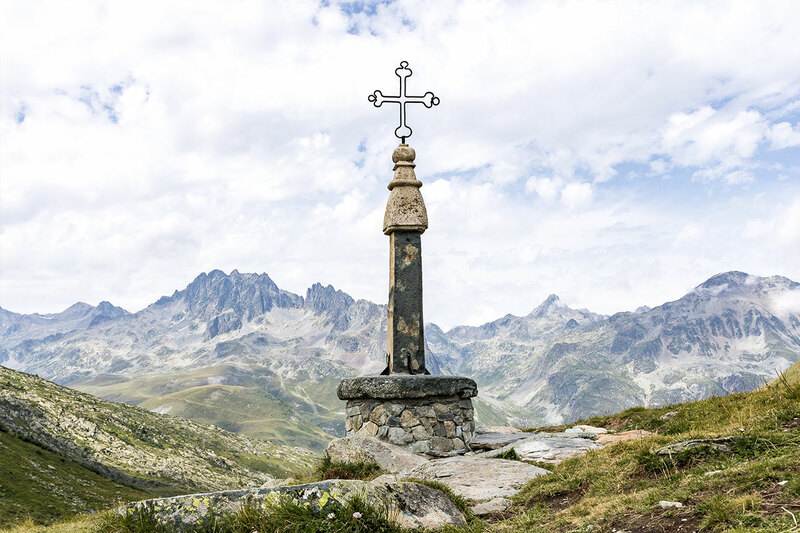 Col de la Croix de Fer: the iron cross that gives the alpine pass its name. 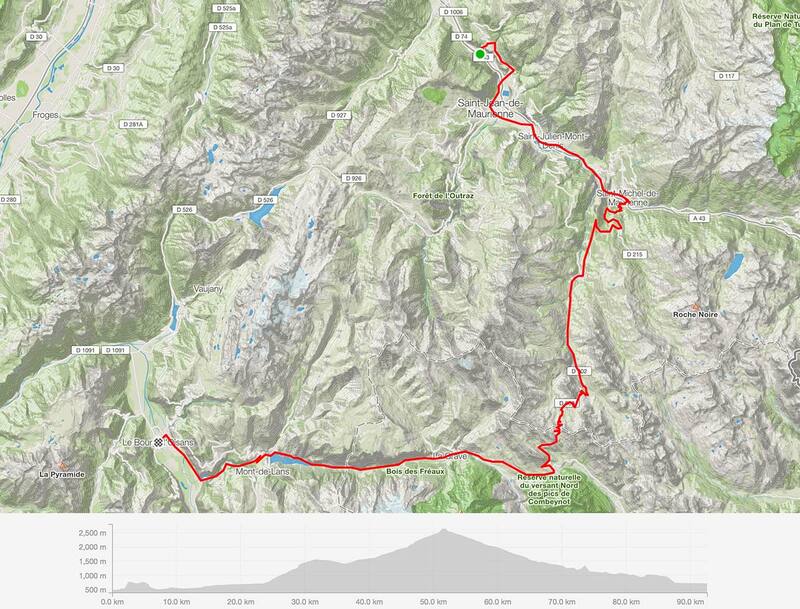 Tour 2 – Lacets de Montvenier, Col du Télégraphe, Col du Galibier. 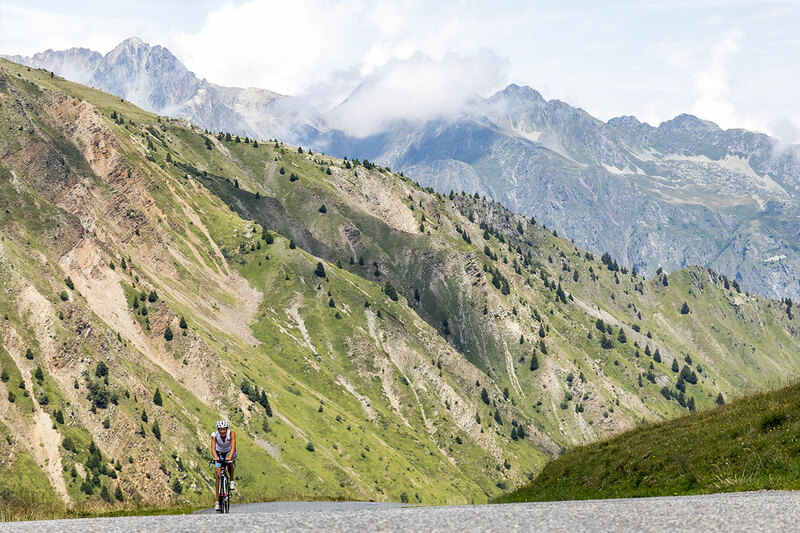 This one-way tour allowed us to combine two absolute highlights: the 18 scenic hairpin bends of the Lacets de Montvernier and the tandem of the Col du Télégraphe and Col du Galibier. 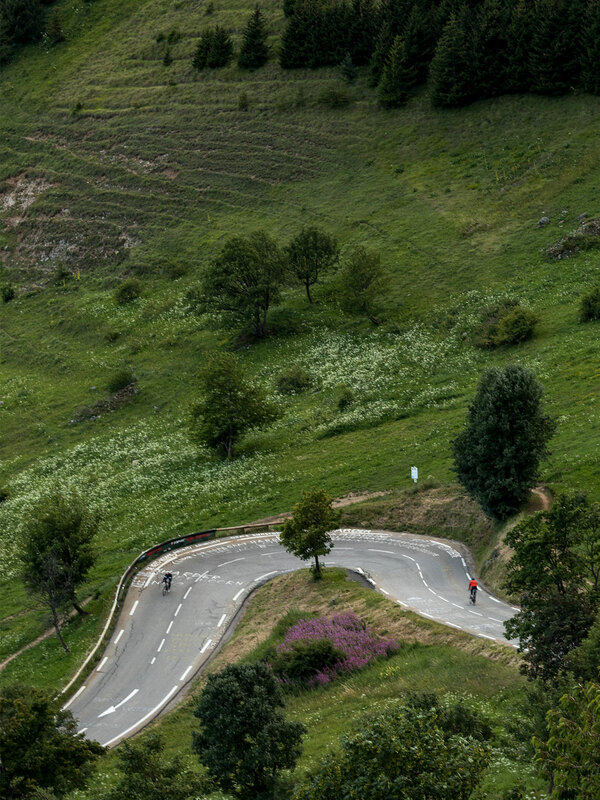 The Lacets de Montvernier is not long or particularly steep, but it’s one of the most scenic roads in professional cycling. 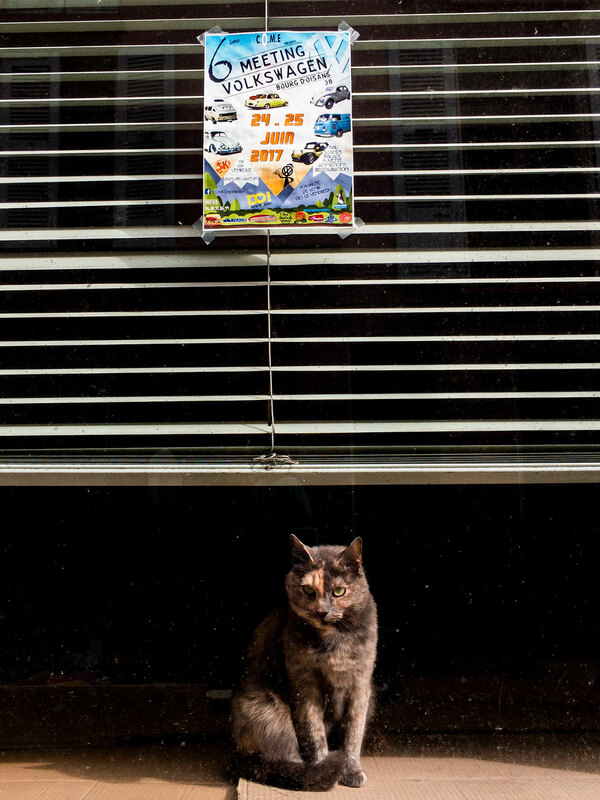 The winding road was included in the Tour de France for the first time in 2015 (YouTube). 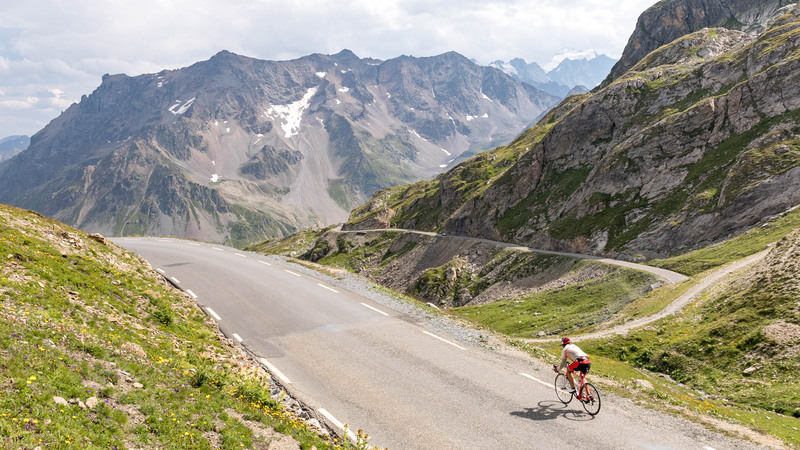 The combination of the Col du Télégraphe and Col du Galibier, on the other hand, is considered one of the toughest rides: here, you have to conquer 1,900 meters over a distance of 34 kilometers. 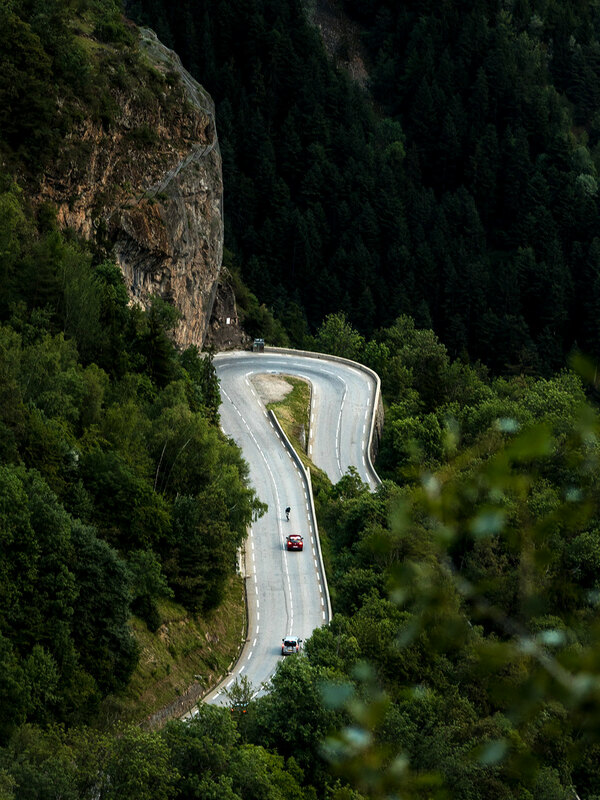 The Lacets de Montvernier is without a doubt one of the most beautiful winding roads you can explore on two wheels. 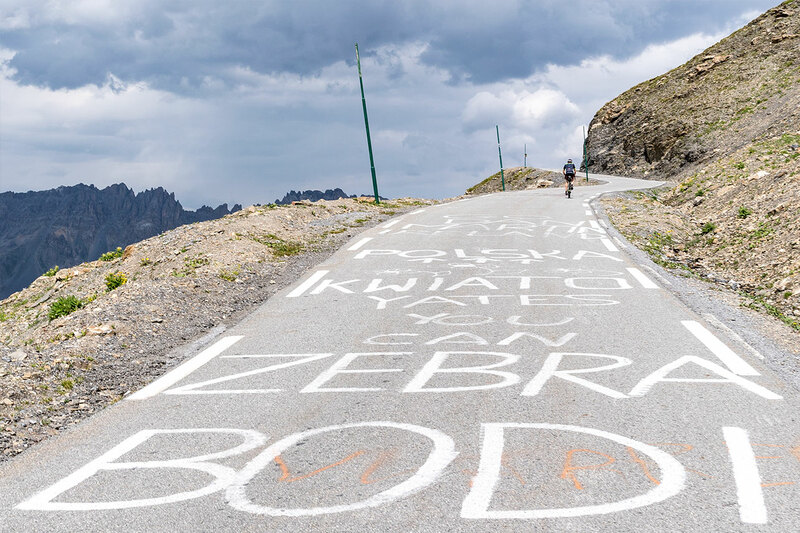 Just the climb to the Col du Télégraphe – the “warm-up ramp” to the great Galibier – already really made the muscles in our legs burn. 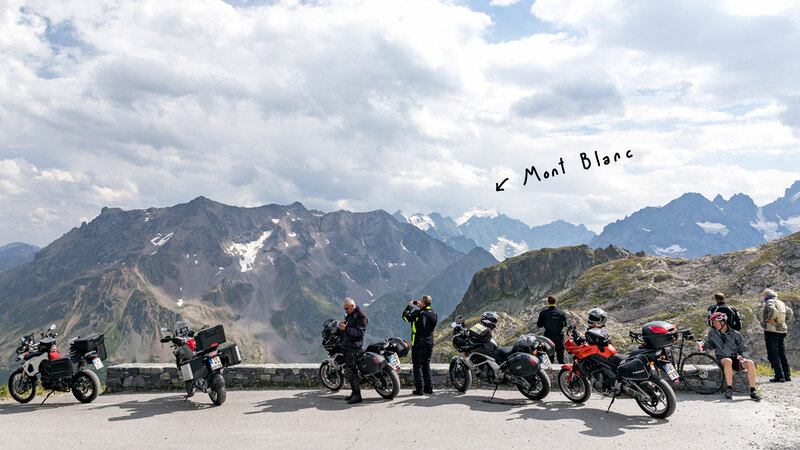 Sadly, we didn’t see our own names on the way up to the Galibier pass. 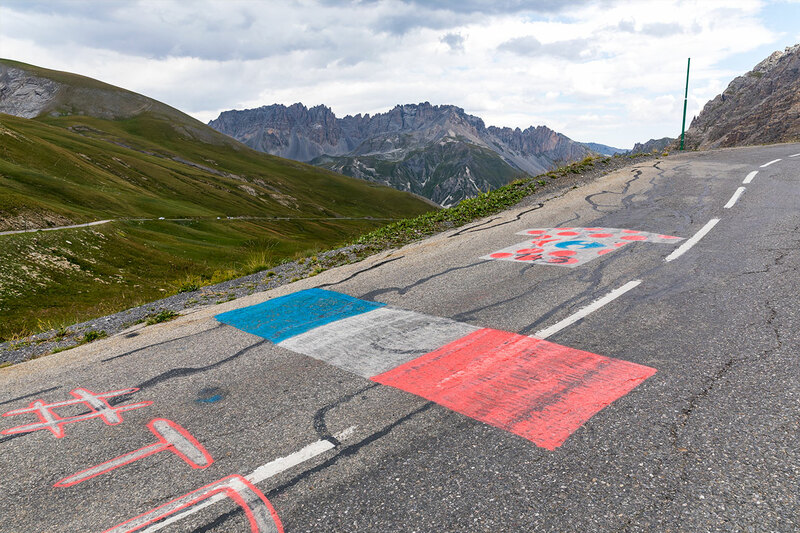 But the drawings on the road were a nice motivation during the climb. 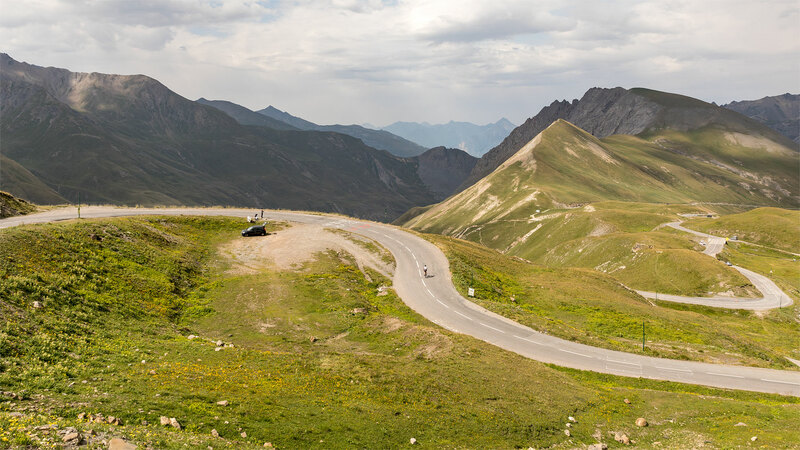 View of the northern ascent of the Col du Galibier. Then enjoy a deep, visceral feeling of satisfaction. 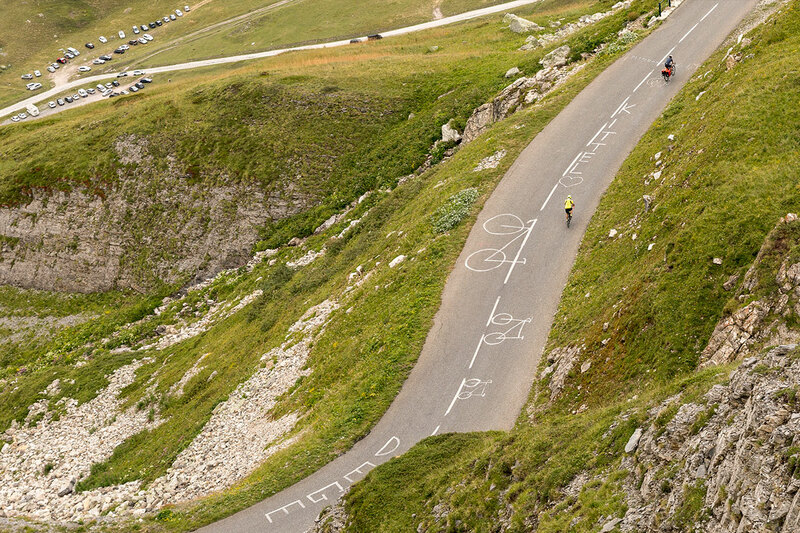 The Col du Galibier was included in the Tour de France for the first time in 1911. 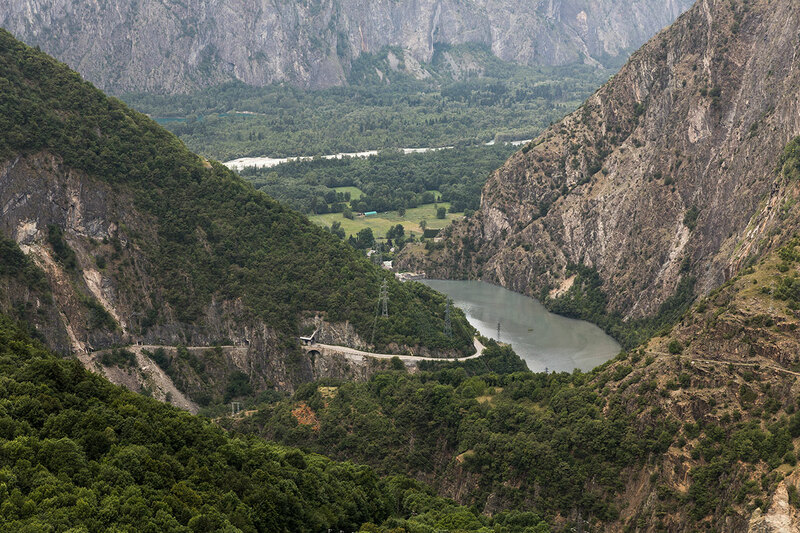 According to Henri Desgrange, the director of the tour at the time, Tourmalet, Laffrey and Bayard were just little hills compared to it. 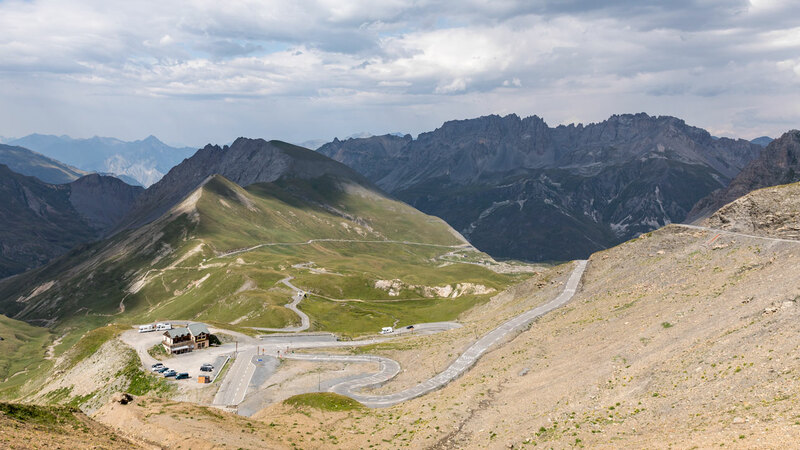 The top of the Col du Galibier pass offers a spectacular panorama that also attracts a lot of motorcyclists. 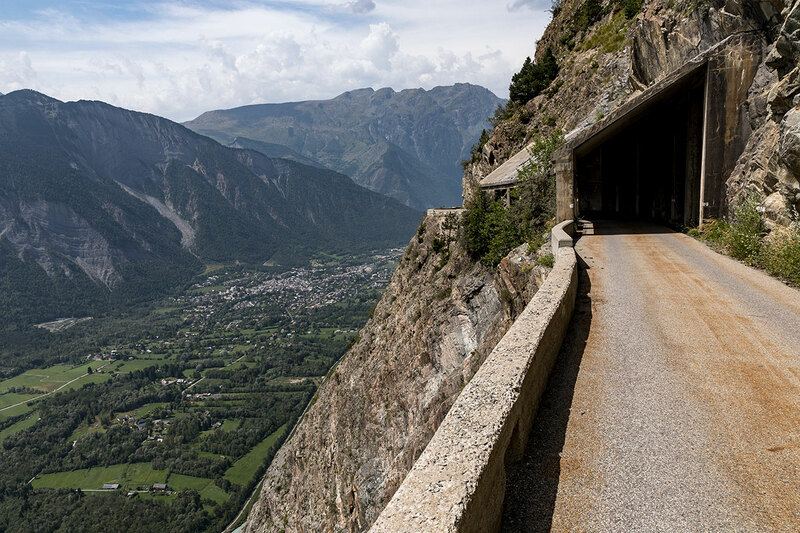 On the south side of the Galibier, it was virtually all downhill en route to our destination, Bourg d’Oisans. No guardrails on the way down added a special thrill. 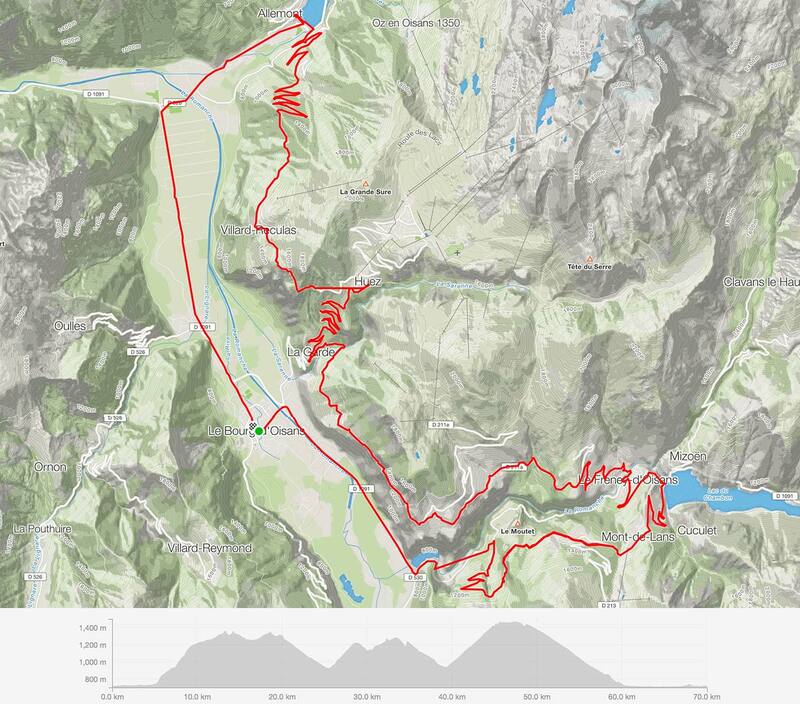 Tour 3 – More than just Alpe d’Huez. 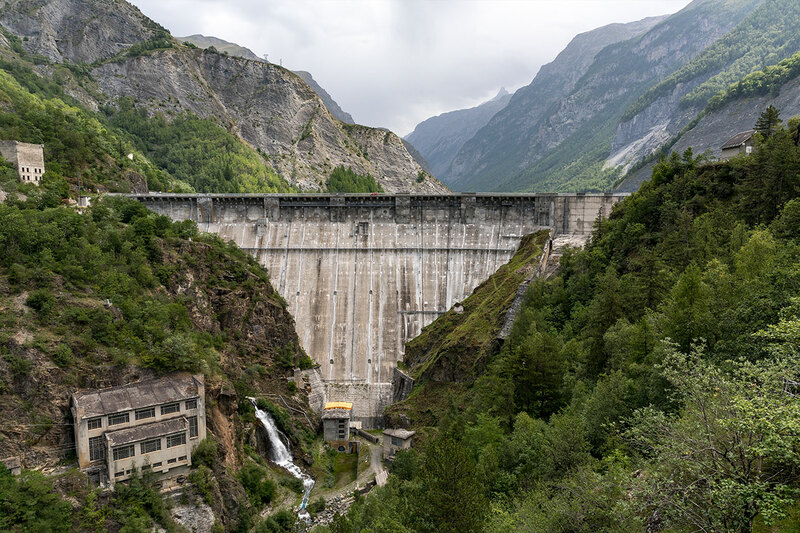 The region around Bourg d’Oisans has more to offer than just the well-known and prestigious climbs. 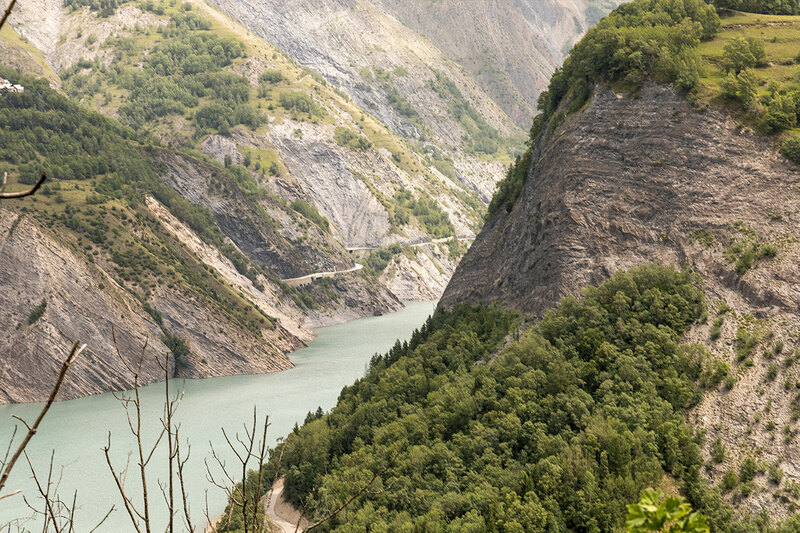 It’s also worth exploring the smaller routes, away from the hustle and bustle. 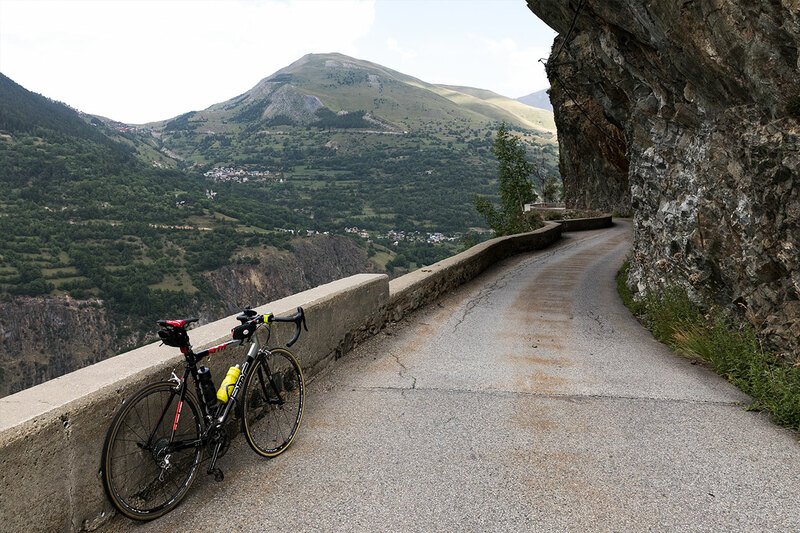 In our case, this tour led us to the legendary hairpin bends of Alpe d’Huez. But the real highlight was a balcony road cut right into the side of the cliffs high up over the valley. Luckily there was hardly any traffic on this vertigo-inducing little road, which is barely wide enough for two cars to pass each other. As a result, we could really let the magnificent views work their magic on us in peace. 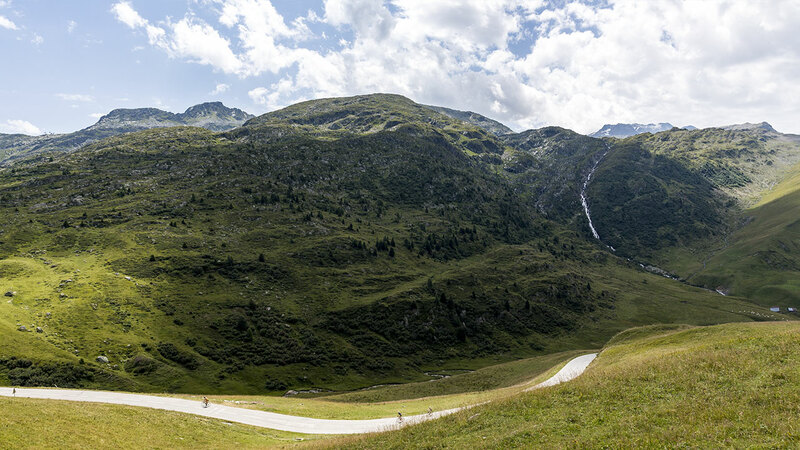 The panorama from the balcony road is impressive. Not recommended for those who fear heights. 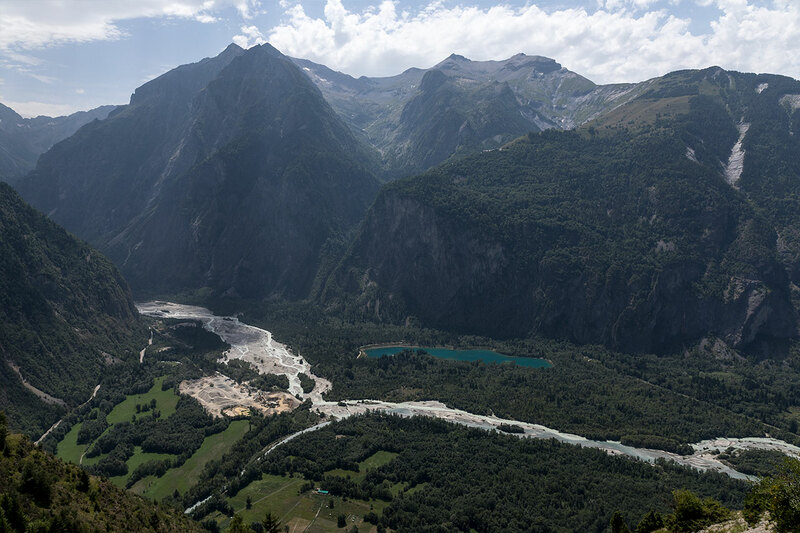 The cliff plunges down into the valley at a terrifying angle. 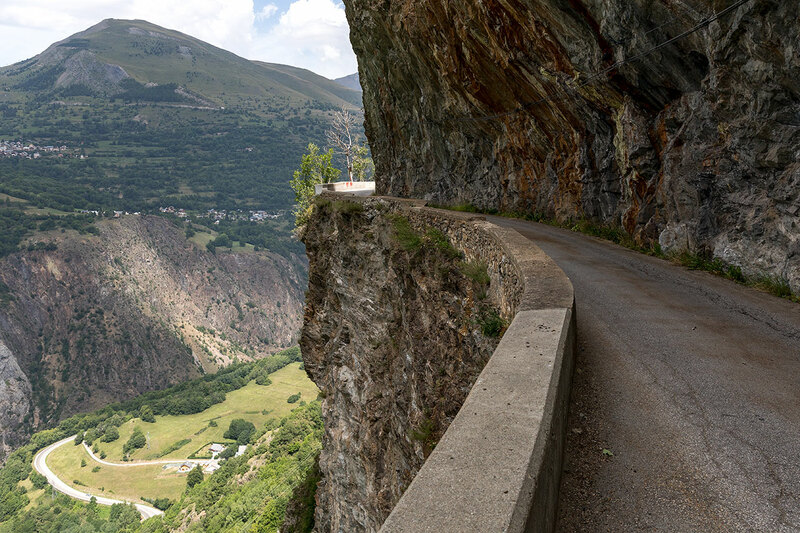 The balcony road led us to the world-famous hairpins of Alpe d’Huez. 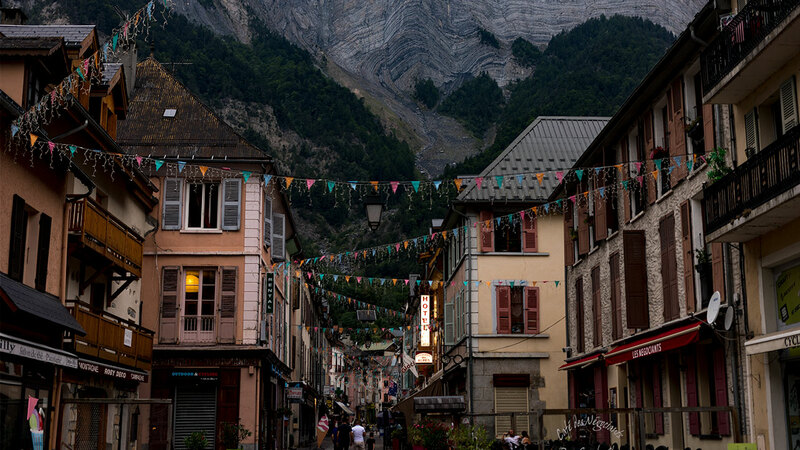 Evening atmosphere in Bourg d’Oisans, our destination.